After the earlier success of my chocolate muffins, I was inspired to give the trusty pound cake recipe another go. Although the recipe calls for a 6 inch can pan, I used an 8 inch ring pan instead coz that is what I have on hand. The rest were 2 inches too big so I really don't want to risk the cake 'stretching' unnecessarily. Since the temperature stated is 375 degrees Fahrenheit, I set my oven to 190 degrees Celsius. Also I added 3 tablespoons of milk to the recipe as I read somewhere that cocoa tends to dry out the cake texture during baking. After the cake had been baking for a while, I noticed the top was cracked. This indicated the oven was too hot or it could be due to my own foolhardiness in using that ring pan! Anyway all's well that ends well. After 45 minutes I realised the cake had shrunk away from the pan edges a little so I quickly removed it from the oven. Luckily no further damage was evident. Phew! Here's a close-up of the end result. Doesn't look too bad does it? Tastes great too I must say. It was a tad dry when it was still warm but after 1-2 days, the texture actually became more moist. To cover up the unsightly cracks, I decided to slather the cake with some chocolate frosting. I used 200 ml whipping cream mixed with half a large bar of cooking chocolate and a small pat of butter for the frosting. Can you believe it was my first time making this? I got really worried when the mixture looked too runny when I poured it onto the cake - I guess I should have let it cool down first before even thinking of using it! Nevertheless, nobody complained about the taste so I reckon it was fine. Once overnight, the cake appearance looked much, much better as the frosting has taken on a nice sheen. This recipe is for keeps! I will never forget the first time I attempted to make biscotti. It was a disaster! Instead of achieving a light, slightly crunchy texture, everything ended up hard as rock. Only the flavour was agreeable but I was thankful that my Mom encouraged me not to give up. She also gamely finished the trial batch which I truly appreciate. Happily, my subsequent attempt turned out better - thanks I suspect mainly to Rohani Jelani's recipe which appeared in a backdated issue of Flavours magazine. 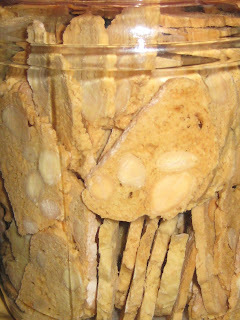 Having purchased several jars of Rohani's splendid biscotti before some years ago, I had never quite forgotten how nice they tasted. So I was estatic when I discovered her biscotti recipe! The results were so good, I actually made about a dozen canisters of them a week before Chinese New Year as pai nin giftaways. Not quite enough to go around so a small coterie of relatives and friends were the lucky beneficiaries. For those who are game to try their hands at churning out a batch or two here's the recipe. Preheat oven to 160 degrees Celsius. Spread whole almonds onto baking tray and bake for 10-15 minutes. Cool thoroughly before using. Cream sugar, eggs and vanilla extract until light and frothy. Using a large sturdy spatula or metal spoon, fold each portion of the flour mixture into the egg and sugar batter. You should end up with a soft, sticky dough. Dust your worktop, baking tray and hands with flour. Roll 1/4 of the dough mixture on the floured surface with your hands. Shape roughly into a log and place it onto the baking tray. Leave enough room in between for the dough to spread during baking. Bake for 15 minutes. The logs should feel firm to the touch. If they are not, bake for another 5 minutes. After that, remove from oven and leave them to cool down. Use a serrated knife to slice the logs thinly. Lay the slices on a clean, dry tray. Bake each side for 6-8 minutes depending on thickness. When done, remove and let the slices cool on a wire rack. Once cooled, be sure to store them in airtight containers. What better way to celebrate Labour Day on the first day of May with some great eats! After reading tons of rave reviews by online floggers, I personally thought it's about time we check out the famous Green View Restaurant in Petaling Jaya for ourselves. Since the outlet is renowned for its Sang Har Meen or freshwater prawn noodles, that was the first dish we ordered. Doesn't it look slurpilicious? Our portions were for two persons but it was enough to feed three adults and one kid. 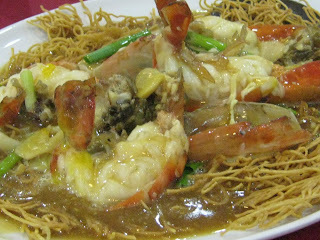 The prawns were fresh albeit a tad overcooked but we had no complaints about the crispy noodles and egg sauce topping. Still both hubby and I agree its taste simply can't rival that of our gold benchmark - the tai shee tow (big tree) outlet behind Kota Raya in KL. 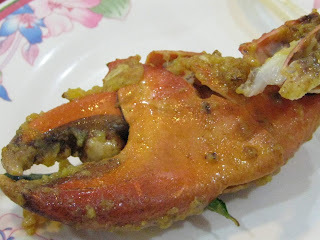 We also had Crabs with Stir-fried with Salted Egg Yolk. I must say the crabs were very fresh and meaty. Just look at the size of the crab claw! It was bigger than a tablespoon ok. Was so busy chomping down on the crustaceans I quite forgot to snap the actual dish ... The dish was a tad rich though and we regretted not ordering it cooked with sweet and sour sauce. Overall, Green View left a good first impression. We probably will return to try the other dishes - that is if we can prise ourselves away from Fatty Crab which has always been our all-time crab feasting outlet. But that's another story huh?